Naomi has decided that she really loves Coopersmith's pot pie. I saw this recipe in the Denver Post (1/12/11) and decided to give it a go, with a few modifications of my own. When I make this, I double the recipe. So what follows is the amount I make. Feel free to scale it back down if you'd prefer. Since Rob, Nathan and Naomi eat meat, I make a larger chicken version. The rest goes into a slightly smaller vegetarian version. Essentially the meat and veggies all get precooked. I toss the chicken in a pan in the oven until it's baked through. I boil the potatoes and carrots until they're soft. And I sauté the onions and celery until the onions are translucent. I also make the sauce. Melt the butter in a medium sized sauce pan. Stir in the flour and cook for about 2 minutes. Slowly add the broth, cream, pepper and salt to taste. Cook for 5 minutes or until thickened and smooth. Then preheat the oven to 350º Fahrenheit. While the oven is warming up, I melt a little butter into the bottom of the two casserole pans that I'm going to use for the pot pies. (I make one with meat and one without.) I lay several (maybe 10?) layers of phyllo dough on the bottom of the pan. 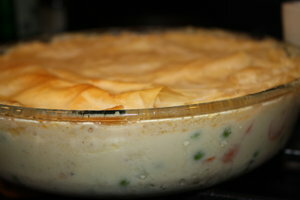 (I know this isn't typical for a pot pie. But we liked it this way.) Then I toss in the chicken, cut into bite sized pieces -- or the seitan, likewise cut into bite sized pieces. I add the veggies and then I pour the sauce over the whole lot. I finish the pie off with the rest of the phyllo dough. I don't bother adding any butter between layers. There's enough sauce to kill a small hamster and a lot of it will soak right into the dough.